An Alberta power plant is proving that there is a solid business case for biomass-based power, and it has attracted international investment attention. What’s a power plant that burns residual wood fibre to produce electricity doing in the middle of Alberta farmland? Well, the plant wasn’t always there and it didn’t always use wood fibre—but it does now and it has attracted attention from investors from as far away as New York. Fred Stock, Dapp Power’s plant manager (left), shows some of the wood residuals the plant uses for fuel. About 70 per cent of its fuel is green woody fibre residuals consisting primarily of bark acquired from West Fraser Timber’s operations in Slave Lake, Alberta. In 2007, White Plains, New York-based, Fortistar acquired full ownership of Dapp Power, located about 130 kilometres north of Edmonton, with its purchase of Calgary-based Verdant Energy. It also acquired 50 per cent ownership in Valley Power in Drayton Valley, Alberta, which also uses woody biomass as its fuel. The purchase of Verdant Energy added the Alberta power plants to Fortistar’s considerable North American alternative energy portfolio, which consists of power generated from 60 projects fueled by methane gas captured from landfills, three natural gas fired co-generation projects, and a large greenhouse division that produces about six million pounds of tomatoes per year. Founded in 1974 as an affiliate of one of the world’s largest insurance companies and headquartered in the United Kingdom, Fortistar began investing in the independent power industry in 1986. Since then, it has invested about $600 million in 25 separate deals to grow its portfolio, including the two woody biomass-based power plants in Alberta. Noll says that Fortistar is definitely shopping for new projects, although their main focus lately has been to streamline operations in Alberta and on opportunities in the U.S. The company has not spent much time investigating the potential use of mountain pine beetle-killed wood in the B.C. Interior for power generation. Noll says two reasons for not taking a serious look at opportunities that may exist in B.C. is the high cost of wood delivery and the uncertainty revolving around long term fuel supply once the beetle wood resource is exhausted. Since woody biomass-based power plants are long term investments, the issue of secure long term supply is a major consideration. Dapp Power consumes about 180,000 green metric tonnes of wood residuals each year to generate 115,000 megawatt hours of electricity annually or about 16.5 megawatts per hour, which it sells under contract and on the Alberta Power Pool. The generator is where Dapp Power makes its money, using wood fibre to heat the steam required to drive the generator turbine. About 70 per cent of its fuel is green woody fibre residuals consisting primarily of bark acquired from West Fraser Timber’s operations in Slave Lake, Alberta. 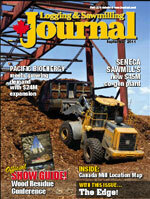 It takes nearly all the wood residuals generated by West Fraser’s plywood plant and pulp mill. 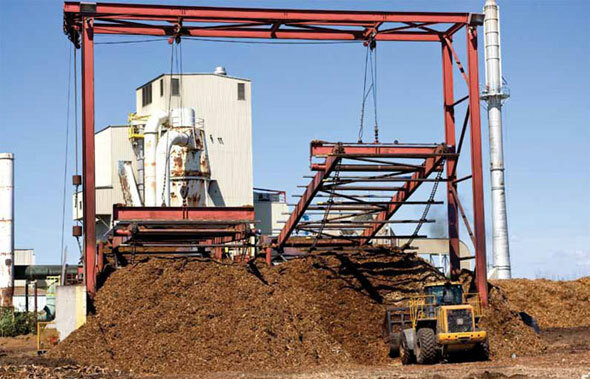 The remaining 30 per cent of fuel is clean wood salvaged from a landfill in West Edmonton, operated by another subsidiary, Bio Fuels Inc, as well as clean wood salvaged from other landfills located in the Edmonton area. The Dapp Power story begins long before its recent acquisition by Fortistar. The plant sat mothballed in California in the 1990s after the forest wood supply there dwindled. Later, the power contract was bought out by the utility, and an Alberta project developer dismantled and transported the power plant to the Dapp location in 1998. The intent was to burn the area’s abundant peat moss in the power plant’s circulating fluidized bed boiler to generate power and sell it on Alberta’s power grid. However, that also failed after 15 months and the plant was mothballed yet again. In 2004, after sitting idle for about five years, the Dapp power plant was acquired by Verdant Energy. 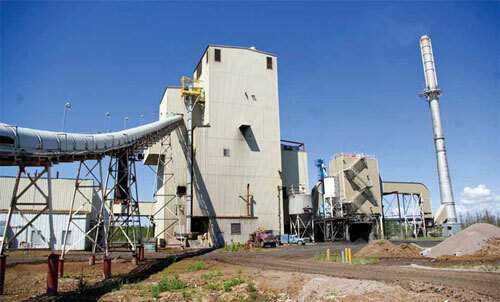 Financing was acquired to modify and re-commission the plant, as well as refuel it on wood waste. The boiler was also converted from a rather unreliable, first generation, circulating fluidized bed boiler to a bubbling fluidized bed boiler, which Noll says classifies it as an updraft gasifier based on the technology that the company has installed at the plant. The wood fibre flow, incineration, and power generation produced at Dapp Power is carefully computer controlled. Because the plant was originally designed to burn wood fibre, modifying the material handling and conveyance system wasn’t a major issue. The challenge was developing a system where the plant could accept both forestry wood waste mixed with wood waste from landfills. The current version of the power plant was commissioned in January, 2006, and it has been generating power ever since—the only major change being the acquisition of Verdant Energy and its assets by Fortistar in 2008. Dapp Power receives about 30 truckloads of woody biomass from both Slave Lake and the Edmonton landfill location every day, delivered in 53 foot walking floor trailers. The waste wood from the landfill is primarily construction waste, and because the power plant only accepts clean wood waste, it must be manually sorted to exclude treated wood and other non-wood contaminants. Another main concern related to the biomass fuel acquired from both the forestry and landfill sources is metal and gravel mixed in with the wood fibre. Dapp Power has four magnets located on its processing line to capture any stray metal. Since the moisture content varies widely between the landfill diverted wood and the forest residuals, Dapp Power blends the wood fibre in a 70/30 mix, attempting to achieve about 30 per cent moisture content in the fuel conveyed to the burner. The forest residuals are typically in the 40 to 50 per cent moisture content range, while the landfill material is usually in the 18 to 30 per cent range. A mix of raw wood fibre from forestry operations and landfills sits in the shadow of the Dapp Power plant, which produces 115,000 megawatt hours of power annually for the Alberta power grid. 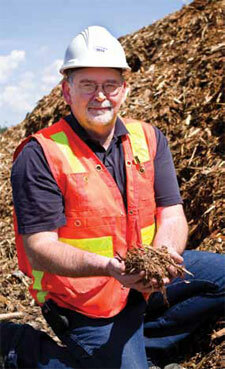 The material is pre-processed at both the landfill and forestry operations, and is sized to six inches or less. When it arrives at the power plant, it is processed again through a custom built stationary hog—that Dapp Power manufactured—down to three inches or less and is stored separately in windrows in summer to encourage more drying, particularly with the forestry residuals. A two month supply of material is stored in the yard, and is typically only held for a maximum of about three months before it is used. The power plant uses a John Deere 724J front end loader to mix the material to achieve the 70/30 blend, controlled by the number of buckets taken from each windrow to the conveyor leading into the burner. The bubbling fluidized bed boiler operates differently from typical grate-type boilers, where, according to Stock, the fuel is deposited onto a grate which is inside a furnace “and burned like a campfire”. 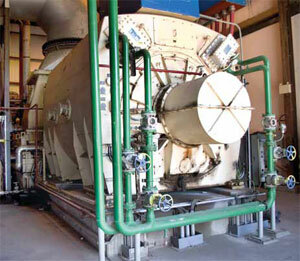 The bubbling fluidized bed boiler has a sand bed that is heated to about 1750 degrees Fahrenheit. The woody biomass is fed on to the sand and is gasified and burned as fuel to heat water in a boiler to create steam. The steam is pressurized to about 1300 psi at 950 degrees Fahrenheit. It is driven through a power generating turbine, which produces the electricity, and then the steam is cooled in a condenser and recycled. The power plant loses some water to evaporation, but uses only a small amount of water taken from two wells. Noll says there are pros and cons to marketing power in Alberta. The biggest attraction is that it has a deregulated power industry and open access to the transmission system. It also has a compliance market for carbon, meaning there is a market for carbon dioxide offsets tied into reduction targets and penalties for those who do not reduce their greenhouse gas emissions, which he says is unique in North America. Government funding sources also exist for biofuel type projects. On the flip side, acquiring financing for these projects can be difficult because they are long term investments and capital intensive, in an environment where there are few long term power purchase contracts in the range of 20 years available. Current contracts are in the five year range, which Noll says is a short time horizon for project developers. Biomass is also a relatively small player in the power generation industry. However, Noll believes that prospects for further development of biomass-based power generation in Alberta are good because there is a significant untapped biomass resource available. The attractive aspect to power generation using forestry biomass is that it is a base load type of power that is available 24/7, as compared to wind and solar power generation, which are intermittent.